As is often the case with my learning online many paths start with a tweet. In my digital storytelling work I have of late become interested in Twitter Bots. There are wonderful bots as well as crappy spam ones. Just as in the rest of life amongst humans. Some make art for you, others poetry, and yet others make a fine go at sounding wise mediated by text at least, like @everyadage above. I have made several posters illustrating the sayings as they are in that uncanny valley space of almost making sense and that interests me. The saying made me stop and reflect. The sense it made for me was in connection with the light and shadow side of groups of people who come together to learn (apologies for the long description but other terms such as communities, connections or networks come with too much baggage for my purpose here) in open online learning events. I have written before and often about the implications of a free-for-all ethos where no social or psychological contract is agreed upon or followed through by participants or facilitators. My cute bot on Twitter seemed to encapsulate, in a no-nonsense way, what I see happens often when people come together at these online events we class as cMOOCs. Those who belong offer a self-congratulary narrative of being open, welcoming and ‘disruptive’ (whatever that is intended to mean) of traditional pedagogies; those who fall at the first hurdles simply do not belong, never get to comment or critique, they are silent and absent from the centre of that event even if (hopefully) at other centres in other networks. Those of us left belonging (whatever that is intended to mean) get on with the job of creating post hoc narratives to make ourselves feel better – rationalisations often about the importance of adult self direction and the free choice of those whose words and/or actions do not echo with that majority and who ‘choose’ to move on to other pastures. What do we do? We try to visualise the situation to understand it. We turn to social network visualisations, put names to the ‘lonely nodes’ and either ignore them or purposefully (and patronisingly?) encourage them to participate. I have both ignored and patronised and it feels bad. In my role as just another participant in an open online event, my duty of care is just what I choose it to be. I’d feel very different were I to be in the role of the teacher. As a teacher, I am responsible for the whole of my class, not just the ones that speak loudest and learn how to play the game quickly. Yet, how to put one’s arms around some of the numbers open online events attract? It is tough for educators who are adapting their teaching to the open web. There is the triumphant narrative of open education, there is less about the limitations of this very narrative to help us create learning spaces that work for more people if not for all people. We throw computing power and abstractions to human interaction in an attempt to make sense and fix a problem we have not yet defined. 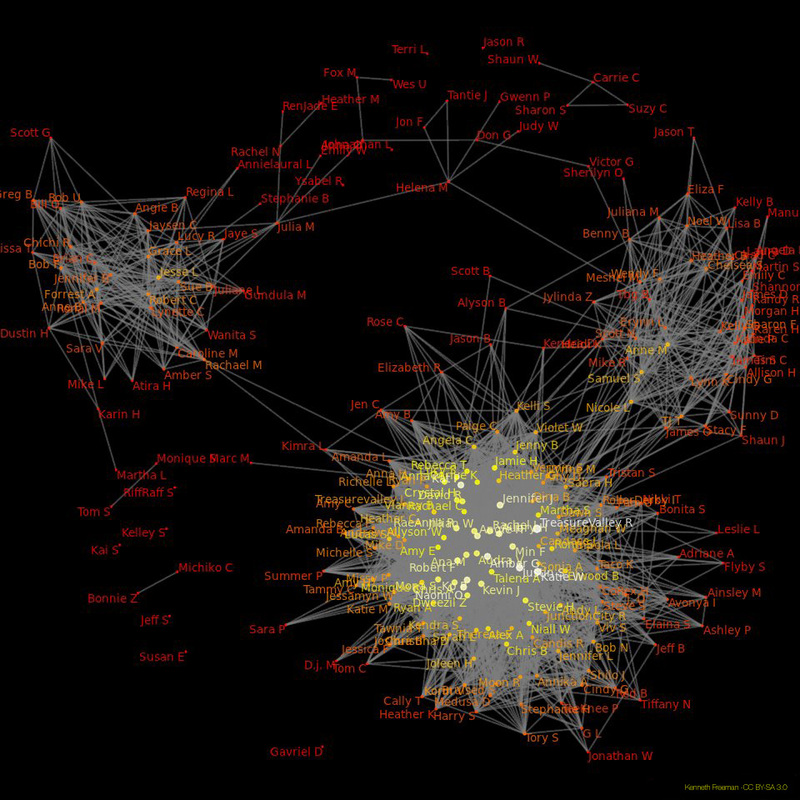 The visualisation of networks seems to me, at times, to create the illusion of understanding whilst merely describing connections outside the system it describes. 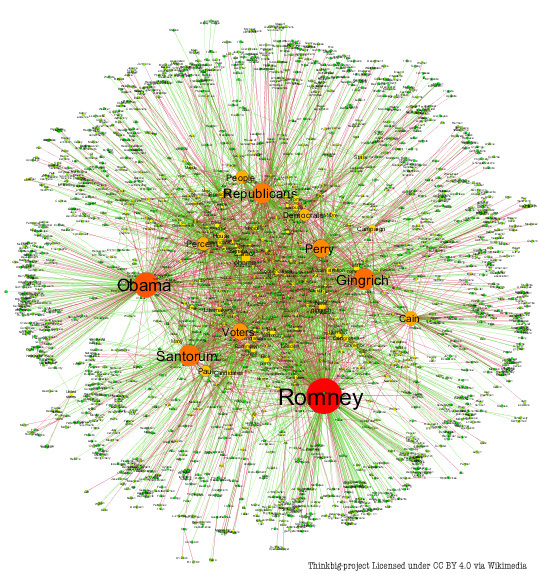 narrative network of US election 2012 – nodes indicate noun phrases, links go from subject to object, color expresses relation of support or opposition. Politicians might talk about trends but the visualisation above does not speak to small group or individual levels of interaction. a social network diagram displaying friendship ties among a set of Facebook users. Both diagrams descriptions speak to support, opposition, friendship – constructs that only make sense in the context of human relationships. I wanted to find a diagram to illustrate my saying and nothing spoke to its essence for me. I spent a long time looking through many examples of social network visualisations trying to find a backdrop. I could not settle for one. None spoke to the heartbreak and the joy that comes from interpersonal needs being met (or not) as we navigate groups online or offline. I kept looking. I then remembered that this type of thing is not new. The number of humans that can be abstracted with huge computing power is new, but attempts to draw social networks is not. I worked with sociograms for years to help small groups improve their dynamics. I was trained and spent hours scoring Bales Interaction Process Analysis sheets with small groups and using primitive software to create diagrams for the same purpose. I searched for images to background my bot wisdom here. Fewer nodes, simpler imagery but still not human enough for my purposes. I then found a lovely article that spoke to my own insight that we have been doing this for way longer than the web and social media, we forget the lineage of our ideas far too often in Ed Tech. The article tracked progress over time in a descriptive rather than evaluative manner. I liked it. Overall, this review of the use of graphic imaging in social network analysis points up a number of interesting trends. Perhaps the most central is the clear indication that imagery has, and has always had, a key role in network research. From the beginning images of networks have been used both to develop structural insights and to communicate those insights to others. Structural insights and communication of these to others seems to underline the intention of such things as the Huma Bird Project and other visualisation tools we use today. Yet, at times,we seem to project onto these diagrams so much more than the maths allow. A little image attracted my attention as I read the article. And it was tiny. I was attracted by its simplicity and humanity. Faces of people rather than ‘nodes’ in a network. Arrows indicating connection but no sense of a label to the type of connection. If you look carefully you see each face has a name – these were real people in a network; some with many arrows, some with few, some with unidirectional arrows, some with bi-directional ones, some with both…a couple with just one unidirectional arrow and on the edge. I wanted to know more. This was an old image. 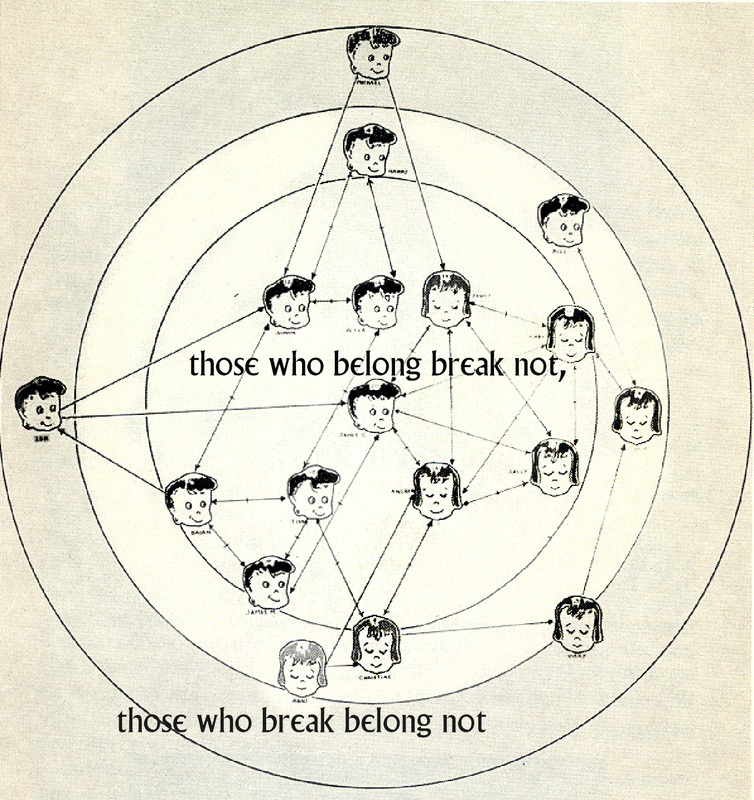 I discovered it was from 1952, from a book by Mary Northway called ‘A Primer of Sociometry’. It depicts a first grade class and their connections! It was hand drawn by Grant, a student of Mary’s. I would have to work hard at restoring the image to be able to use in my poster, but this was definitely it. Social networks then and now, where the ‘then and now’ is not just historical past and present but also past and present in an individual life. I hear the analogy of social media interaction being like the playground far too often in online conversation – with it cliques, its bullies, its fights and gossip. Or its ideological obsequiousness to be accepted and included, where critique and challenge are the exception rather than the rule. A social network of first graders adding meaning to a saying from a Twitter bot, seemed to embody online contradictions without a triumphalist narrative. I may be the only one appreciating how this speaks to the shadow side of living and learning on the web, but that is good enough for me. It was worth the research and the editing work to make it. It will remind me to pay attention to ‘those who break and do not belong’ with an intent to understand rather than patronise and to lose the arrogant tone of encouraging ‘participation’ without inquiry. These issues matter if open education is to become a safer environment for all to learn, and may be I am setting my aspirations just too high?